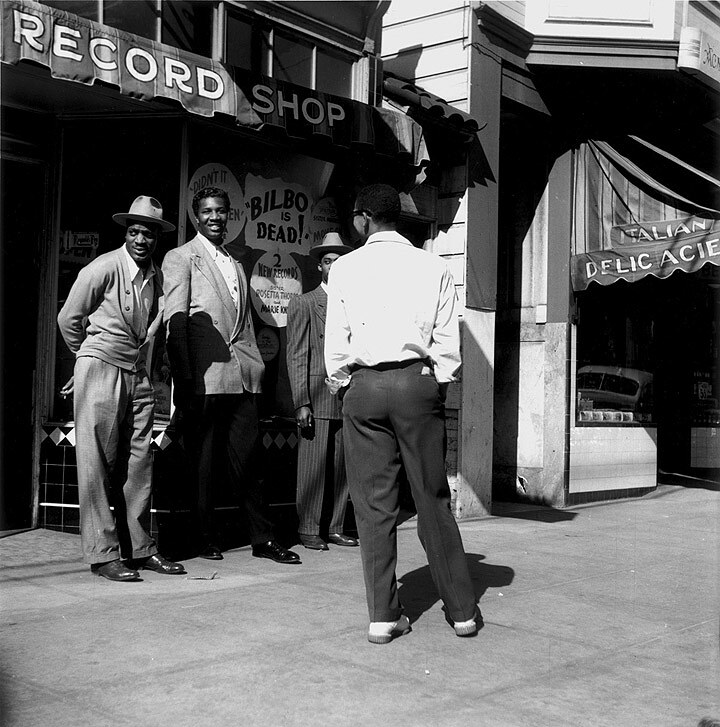 Melrose record shop at 1226 Fillmore Street, c. 1950. Intersection of Fillmore and Post, looking south/southwest, c. 1950s. 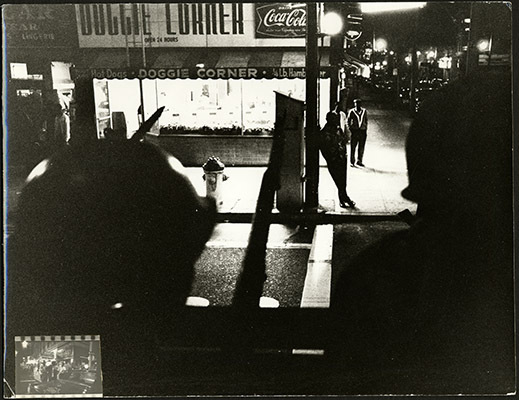 Fillmore Street at night during the curfew imposed after the September 27-October 1, 1966 Hunter's Point uprising. Former Redevelopment Agency official Carlo Middione describes providing a property at Golden Gate and Fillmore to Angela Davis and "her group" in the late 1960s. 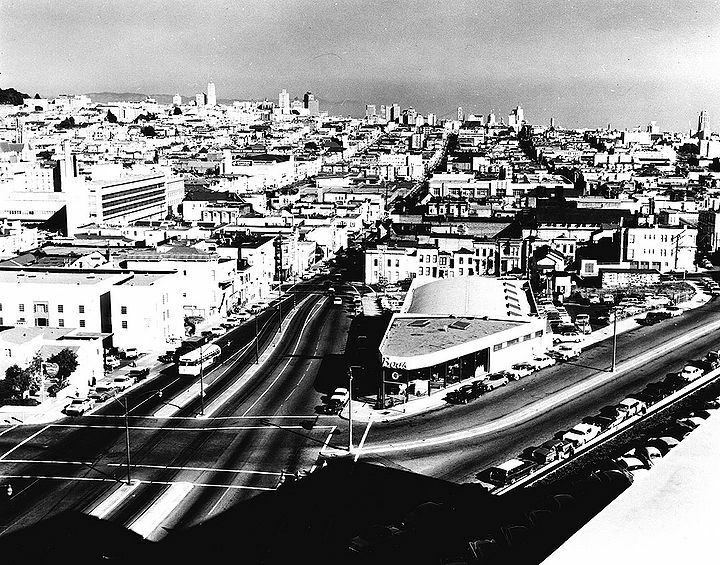 Geary Blvd before widening, seen here looking east from Baker and St. Joseph's, Nov. 7, 1958. 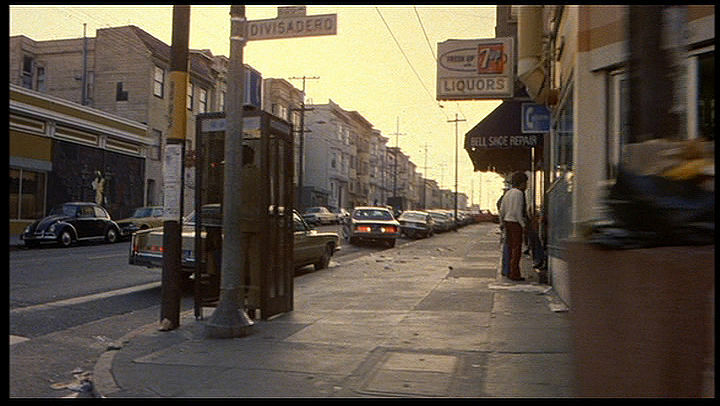 Corner of Divisadero and Hayes, 1978, iconic mural in background. In the late 1970s, this area, called NOPA in the 2000s, was almost entirely African-American. 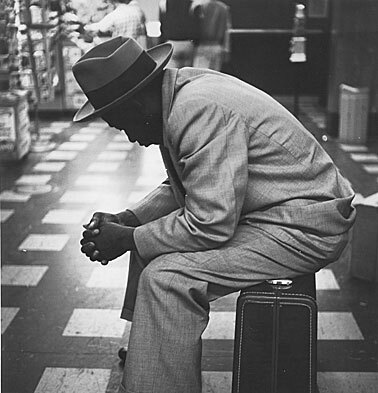 Between 1970 and 1980 the black population of San Francisco dropped by 10%, from 96,000 to 86,000 (1980 Census). Exodus from San Francisco, a recurrent phenomenon since the early 1970s. The Western Addition, centered on Fillmore Street, was once a cultural center of a vibrant neighborhood along the lines of New York's Harlem or Chicago's South Side, albeit quite smaller. 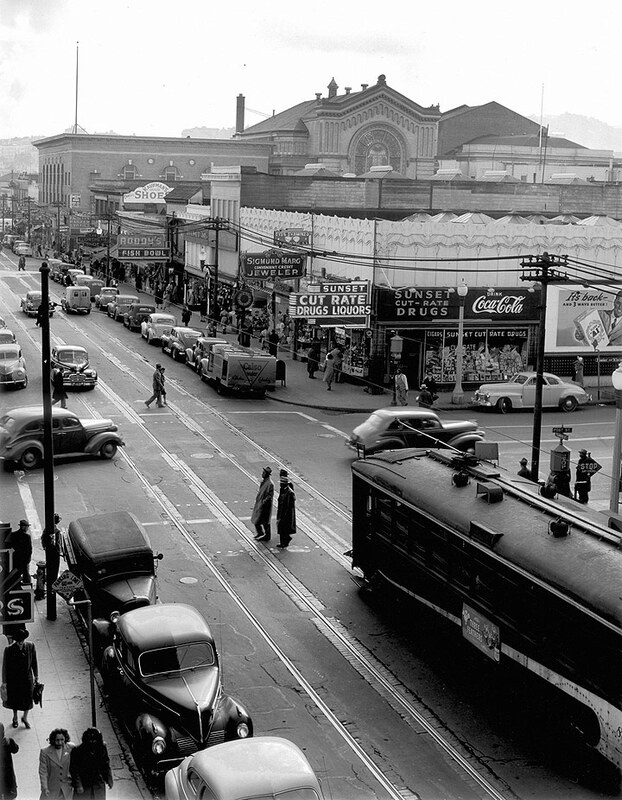 Before WWII, in the 1940 census, there were just a little over 2,000 blacks living in the Western Addition (the area enclosed approximately by Pine, Divisadero, Gough, and Hayes Streets), and only about 5,000 in San Francisco. World War II troop movements, munitions shipping, and rapidly expanded war production around the Bay drew thousands of blacks from Texas, Oklahoma, Louisiana, Mississippi, and other points in the deep south. Many settled in Oakland, but a favorite destination was the Fillmore area in San Francisco. 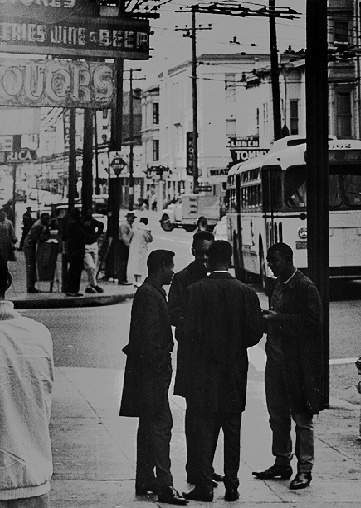 By 1950 there were 15,000 blacks in the Western Addition, and nearly 50,000 in SF. After peaking at 100,000 in the early 1970s, the results of decades of corporate planning and urban re-development led to the demolition of hundreds of homes in the Western Addition, largely concentrated in black-occupied dwellings. This real estate maneuver was spearheaded by Mayor George Christopher, and the SFRA's Justin Herman. The African American population dropped to less than 40,000 by the 21st century. 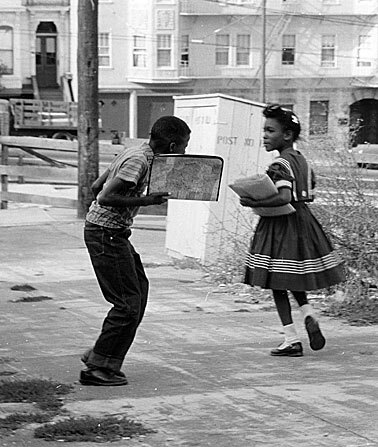 Children going home from school in Western Addition, mid-1960s.